I might have a teeny, tiny bit of a problem as a crazy picture taking mama! It seemed to be an especially big problem when my son was younger and he was doing so many new and amazing achievements and milestones everyday! I just couldn't take enough to show family and friends. I definitely ran out of places to store all my photos really quickly! With my daughter due any day, I am getting ready for the picture-taking frenzy again and I am prepared to store all of them safely and quickly this time with my new Picture Keeper! Picture Keeper is the world’s first all-in-one USB device with embedded software to protect pictures and other irreplaceable files. Picture Keeper is the easiest way to create a safe copy of all your digital pictures! Plus, it makes sharing and printing pictures easier than ever. Not only does the Picture Keeper safely store all those precious photos, but it is so easy to do...and without extra software! And with a newborn and a two year old, that is so important to me! I love that it automatically searches and finds all my pictures and, best of all, only adds the newest images! To me, that is what sets Picture Keeper apart from other plain USB's. I hate when I have to go back, see which ones I already added and go through my thousands of pictures. NEVER AGAIN with Picture Keeper!! If you can't take enough pictures of your precious babies, children, pets, or other activities, then make sure to have Picture Keeper to store them all! Buy It: You can purchase the different sizes of Picture Keeper on the Picture Keeper website and also at many local retailers near you, including Walgreens! Picture Keeper has a very Special Offer for all my amazing readers! Purchase a Picture Keeper at participating Walgreens stores, and receive a coupon for a FREE 30 minute remote computer tune-up/support call (a $50 value!). 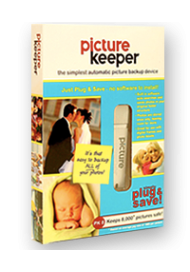 Win It: Picture Keeper is generously offering (1) PK-4 Picture Keeper to a lucky winner!